Today, they propose on FB (FaceBook) to change your profil picture into an animation hero during you loved your childhood. Most of people did so, and the result on FB was … so cute! “Alladin“, “Saint Seya” (Knights of the Zodiac), “Totally Spies“, “Bouba” (wink to my sister), “Chip ‘n Dale Rescue Rangers” (Tic et Tac, les Rangers du risques in french), … every kind of animation movies were there : from Blockbuster, pass by Mangas, and ended by 2D mini-series. No wonder nostalgy comes along. When I was a child, there were time I wanted to be a drawer for animation movies. I was so amazed how those people could transform their imagination into something awesome that they can share to the world. During the 90’s, the 3D technology on screen (not out screen like nowadays) have just been released. 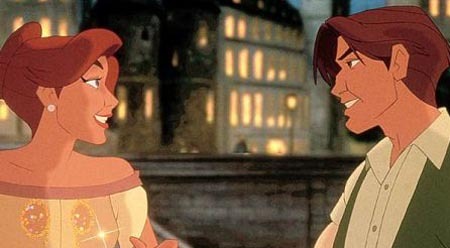 Anastasia (1997), which is my avatar on FB now, was one of the first animation movies to use that technology. I was so, and I’m still, so enchanted by their melody, … then pictures and, of course, … the chemestry between Anya and Dimitri … Later on, I discover that animation movie was produced by 20th Century Fox, and they chose Aaliyah (Are you that somebody, We need a resolution) to perform “Journey to the past” one of the soundtrack. She also performed as a singer and as an actress in “Romeo Must Die“, do you remember “Try again“? it hits! 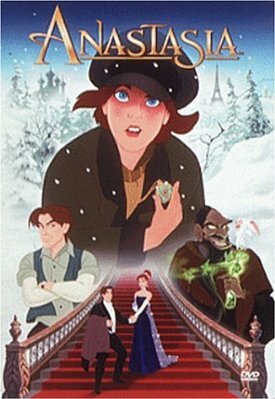 But still, my favorite in “Anastasia” is “Once upon a December“. Anastasia: What? Hey – why are you circling me? What were you, a vulture in another life? Anastasia: Do you really think I’m royalty? Dimitri: You know I do! Anastasia: Then stop bossing me around! Dimitri: [after making a deal with Anya] May I present… Her Royal Highness, the Grand Duchess Anastasia. Anastasia: Pooka, we are going to Paris! Dimitri: Uh, the dog stays. Anastasia: I’m talking about the dog goes. Dimitri: No, the dog is not going. Anastasia: I say he’s going. Dimitri: I’m allergic to dogs. Dimitri: Just leave the dog. Anastasia: I am not leaving the dog! Dimitri: Look I think we got off on the wrong foot. Anastasia: Well, I think we did, too. But, I appreciate your apology. Anastasia: Please don’t talk anymore, it’s only going to upset me. Dimitri: Fine, I’ll be quiet if you be quiet. Anastasia: Alright, I’ll be quiet. Anastasia: Fine… So you think you’re gonna miss it. Dimitri: Miss what? Your talking? Dowager Empress Marie: You were the boy, weren’t you – the servant boy who got us out? You saved her life and mine and you restored her to me. Yet you want no reward. Dowager Empress Marie: Why the change of mind? Dimitri: It was more a change of heart. I must go. Sophie: It’s a perfect ending. Dowager Empress Marie: No. It’s a perfect beginning. Yes! Malagasy Movies can be great!